Tech Blog: How to integrate Liquibase with Spring and Hibernate ? 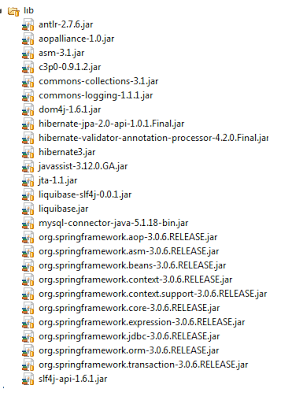 How to integrate Liquibase with Spring and Hibernate ? A sample tutorial on how to integrate Liquibase with Spring and Hibernate. 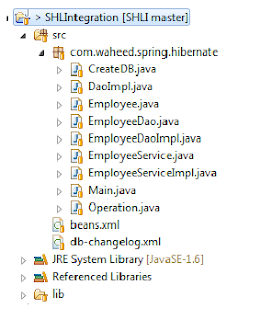 While writing this tutorial, I have added javadoc in the code for better understanding and I believe You already have good knowledge on Spring and Hibernate. The main motto of this tutorial is to give an idea on how you can integrate Liquibase with Spring and Hibernate. To integrate liquibase into your project, you need liquibase jars, So download it before starting the project. 1. Create Employee class having getter/setter and add proper JPA annotation to each variable as below. Please feel free to do comment or drop me a mail regarding any suggestion/Feedback. Why is hbm2ddl set to create? How does creating liquibase bean is sufficient for integration? hbm2ddl can be create or update. I guess u have missed "dataSource" property in bean. dataSource is another bean where you are configuring your database details. Adding database mapping file i,e db-changelog.xml. Check source code for better understanding. I have the same question : Why is hbm2ddl set to create?